"These days, fake flesk looks and tastes just like the real thing. Is this end of meat?" 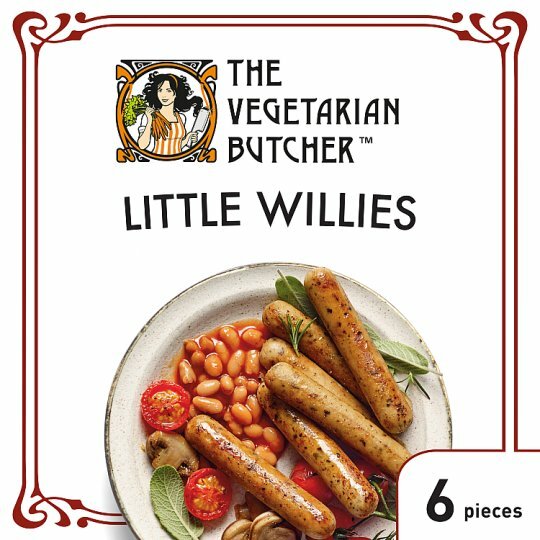 Our Little Willies are delicious miniature versions of the traditional Lincolnshire sausage and are, as tradition requires, flavoured with sage. Well-seasoned and rich in protein, these tasty wonders can easily compete with any culinary giant and perform better in terms of animal and human health, as well as the environment. Fantastic as a snack or as part of your English breakfast, on top of a pizza, salad or on a skewer at the BBQ. Store in sealed packaging in the refrigerator (4°C);, After opening, keep refrigerated and consume within a few days., This product, suitable for re-freezing only on day of purchase., Best before : see front. Grill (From Ambient): Grill the Little Willies in oil or butter until nice browned on all sides. Shallow Fry (From Ambient): Fry the Little Willies in oil or butter until nice browned on all sides.